Select Components > Legislation from the drop-down menu in the administration (back-end) of your web site. 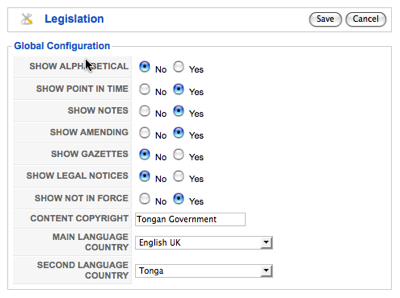 The Legislation Manager is where you can edit existing Legislation types or create new ones. The default view displays PRINCIPAL legislation in a list form, and clicking on the links below the PRINCIPAL MANAGER heading (in row B), other types can be accessed including SUBORDINATE and AMENDING legislation. Depending on the site SETTINGS; GAZETTES, NOTICES and BILLS can also be accessed. In doing so, associated default lists for GAZETTE TYPES, BILL STAGES and NOTICE TYPES can also be edited to conform with local processes. Also, while the PRINCIPAL MANAGER is active, legislation CATEGORIES can be created and edited. Categories are used arrange the legislation into logical interest groups. Row A - Is the TOOLBAR row. It contains all the toolbar action buttons for associated processes. NOTE: Some buttons will require an item to be selected using the SELECT column (section E) check box next to the required item. Even though more than one item can be selected, the system will only allow one item to be chosen at a time (for work-flow reasons). When the Legislation component is selected via Components > Legislation from the drop-down menu the default view is the PRINCIPAL MANAGER. New Principal. Clicking this toolbar button will initiate a new item of Principal Legislation (Act). New Version. Most legislation will be amended from time-to-time. iLAWS allows amendments to be linked to the parent item based upon a date. At some point a new version (reprint) will be created after significant amendments have accumulated. To enable the point-in-time aspect to function correctly the physical amendments are incorporated into the CURRENT Principal legislation by the responsible authority, and a new version is generated with its own commencement date. The amendments (linked to the previous Principal parent item) will disappear from the list presented to the public (front-end), but will still be available in this administration screen (back-end). If someone selects a point-in-time in the front-end before the New Version's commencement date, the old amendments will be displayed. To produce a new version, the CURRENT file must be selected (via the SELECT column), and the New Version toolbar button pressed to initiate a New Version of the Principal file. Repeal. The CURRENT version of an item of Principal legislation is selected (via the SELECT column) and the Repeal button on the toolbar is pressed to begin the Repeal process. Add SL. 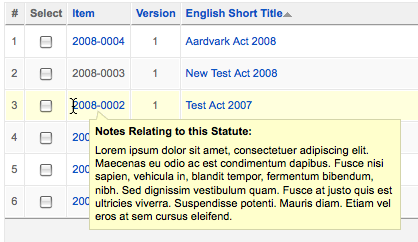 To ensure that each item of Subordinate Legislation is linked to its parent, the ADD SL button is included in this layout. The process begins by selecting the CURRENT parent item (via the SELECT column), and then clicking the Add SL toolbar button. 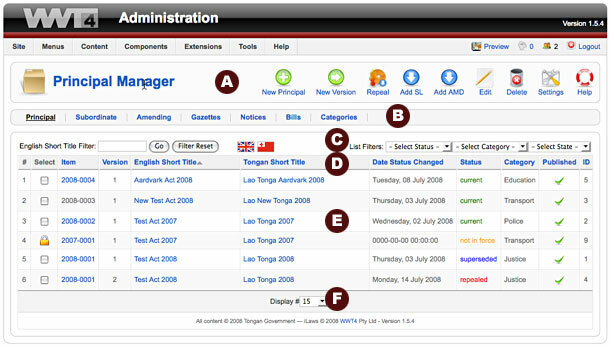 Add AMD To ensure that each item of Amending Legislation is linked to its parent, the ADD AMD button is included in this layout. The process begins by selecting the CURRENT parent item (via the SELECT column), and then clicking the Add AMD toolbar button. Edit. Click on this button to EDIT an item of legislation. The fields that can be edited are very limited as the integrity of the whole legislative process depends on the previously entered data being preserved. Normally in this screen the category and notes are the only fields that can be modified. However if an item is NOT IN FORCE, the status and commencement date can be modified. Delete. Click this button to delete any item of legislation. If the item has children (subordinate or amending files), the process will abort and inform the user to resolve these files before the parent can be deleted. NOTE: Deleting a file will remove the file and any uploaded files from the server, so please use DELETE with care. Settings. This toolbar button only appears on the PRINCIPAL MANAGER page, and allows the whole operating environment of this iLAWS System to be configured for the local processes. Principal. This link is the default link and presents all Principal Legislation. Subordinate. Click this link to go to the Subordinate Legislation page. Gazettes. Click this link to go to the Gazettes page. Notices. Click this link to go to the Notices page. Bills. Click this link to go to the Bills page. Categories. Click this link to edit or add categories. Gazette Type. This is only available when the GAZETTES sub-menu has been selected. It allows the types of Gazettes to be entered or edited. Notice Type. This is only available when the NOTICES sub-menu has been selected. It allows the types of Notices to be entered or edited. Bill Stages. This is only available when the BILLS sub-menu has been selected. It allows the stages of the Bill to Act process to be entered or edited. You can filter the list of items by typing part of the short title. You can also select a combination of Status, Category and Published State. Select Status. Use the drop-down list box to select the status: CURRENT, SUPERSEDED, REPEALED or NOT IN FORCE. These selections are permanently embedded in the system. By selecting "- Select Status -" items containing all status levels are displayed. Select Category. Use the drop-down list box to select the desired Category. By selecting "- Select Category -" items containing all categories are displayed. Categories can be edited via the CATEGORIES sub-menu. Item. Contains a number that will identify the item. Usually the number is related to the item itself (e.g. 2008-0004 is Act 4 of 2008). The number's format is critical and must be in the format YYYY-NNNN. The item numbers in section E can be hovered over to check the notes for the file. Items in BLUE have notes. Items in GREY do not. Version. Sequentially numbered as a whole number, and clearly identifies each version. If point-in-time is turned off in the SETTINGS then this version number is omitted. Date Status Changed. Contains the commencement date for CURRENT files, and the SUPERSEDED or REPEALED dates for the corresponding status items. NOT IN FORCE status items will show a zero date/time in the format... 0000-00-00 00:00:00. Status. Contains the status applied to the file. CURRENT or NOT IN FORCE are applied at the generation of a New Principal file, whereas the status of SUPERSEDED and REPEALED are applied automatically during the New Version or Repeal processes respectively. Category. The Category this item belongs to. The CATEGORIES can only be assigned through the PRINCIPAL MANAGER screen , and can contain any value and any number of categories. You must add at Principal Legislation before adding any Subordinate or Amending Legislation.